With our comprehensive reports and graphs, you can save a lot on your fleet's operating costs. SXnavo capabilities in the tour and travels industry are proven to provide competitive advantage and reduce operation cost for organizations. SXnavo provides customized solutions to the Radio Taxi and Car Rental companies to locate the geospatial location of the passenger or the empty car on the map, its destination, and the details of the driver. 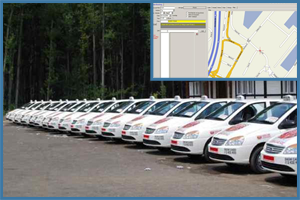 With the help of SXnavo, the operator can dispatch the nearest available empty cab to the tourist asking for the vehicle. It helps in saving cost for the car rentals and faster service to customer. SXnavo provides immediate alerts that you set, like the rules for speed, path that vehicle needs to travel, halt time, speeding, sudden breaking, useas of air conditioner and other parameters for your vehicle. SXnavo provides reports on violation of these rules alerts you through SMS and email. SXnavo keeps you informed about every movement of your vehicle. Fuel reports and graph, driving performance and over-speed reports extends your vehicle life, increases operational performance and even reduces fuel costs. A panic button for the driver to alert fleet manager during any emergency. Automatic alerts on accidents of the vehicle. Additional online accounts for your customers to keep track of the vehicle and delivery time. SXnavo provides a control on all dashboards in the cabs with two-way communication process which makes it widely popular in the travel and tour industry.